A lot of us remain confused about our career choices, but not Rohan Bhasin. When three-year-old Rohan was asked to introduce himself by his playschool teacher, Sudha Satyan, he confidently said 'Captain Rohan Bhasin'. Fast forward 30 years and Sudha found herself on an Air India flight to Chicago. When the crew made the announcement about the pilot, she couldn't believe her ears. In a touching coincidence, the plane was being piloted by none other than her student from 30 years ago! Once she settled down in the plane, she reached out to the cabin crew and insisted she meets the pilot. And her guess wasn't wrong - she reunited with her student, who was now a grown, successful pilot. Can you imagine how proud she must have felt? Rohan's mother Nivedita Bhasin took to Twitter to share 'then and now' pictures and details about the heartwarming reunion. She wrote, "#WarmsTheCocklesOfMyHeart....During Playschool admission, the teacher asked my son his name. Nonchalantly he answered, "Capt Rohan Bhasin". And he was just 3. And today, the same teacher was en route to Chicago. And he was indeed the Captain. 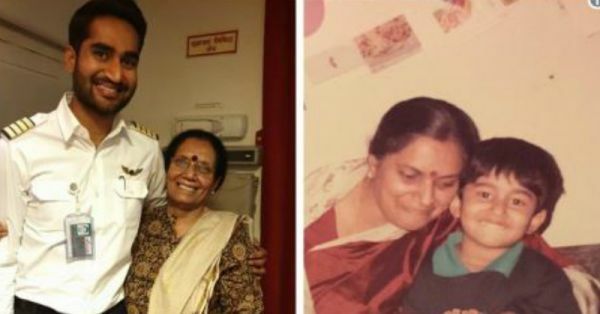 🤗👨‍✈️#StudentTeacherReunion❤️"
Rohan's passion and determination to become a pilot at such an early age was not surprising, as flying was in his genes. His grandfather, Captain Jai Dev Bhasin was among the first seven pilots back in 1954 to become a commander. Both his parents are also pilots with Air India. Isn't this the sweetest thing you read today? We're certainly wiping away our tears!